Alan Horne has torn his rotator cuff and will be out for the 2010 season. This guy has been through a lot. Aceves' back is still soar and he is day-to-day. This reoccurring problem may keep Alfredo off of the roster for opening day. River Ave Blues has a great breakdown of the Red Sox in preview for the 2010 season. The Yankees really have no idea what to do about Joba, NoMaas makes this very clear. NYY Stadium Insider has been chronicling the demolition of the original Yankee Stadium, Gate 2 has been taken down. Teixeria (right) was hit by a pitch in the game tonight vs the Orioles. He was examined but no x-Rays were taken. Pat Venditte, the Yankees ambidextrous pitcher, will be making a minor league start tomorrow. Here are the boys at the Knicks game. 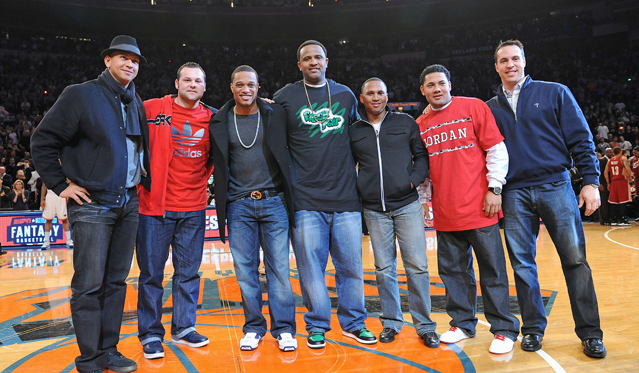 Notice the different styles of dress (A-Rod, Melky, Tex). CC and Melky matched their shoes with their shirt. That is very impressive for Melky; he strikes me as a guy who doesn't know what day it is. Man this game was short wasn't it? That's really due to Andy Pettitte and Jarrod Washburn who both turned in very nice starts. Andy was really impressive in this one. Unlike in past starts at the Stadium he seemed to be challenging guys more, he wasn't nearly as afraid to throw strikes as he was in other starts. Jarrod Washburn matched him as well as you could have hoped for him to though. The Yankees got a lead briefly in their half of the third on a Johnny Damon homer but the Mariners managed to manufacture a run in the fourth after a leadoff double by Javier Lopez to tie it back up. In the fifth when Melky hit a solo shot the Mariners came right back the next half an inning to tie it up again on a Ken Griffey Jr. homer. I'll say this for the Mariners, they definitely don't give up easily. This tie wouldn't last that long though. With Washburn still in, Mark Texeira led off the sixth with a ground ball base hit jsut beyond the reach of the Mariner's third baseman. Next up was A-Rod and he continued his hot hitting with an absolute bomb to dead center. This was no cheap New Yankee Stadium home run. When it finally dropped into Monument Park, the Yankees pulled ahead for the final time. Andy would throw one more scoreless inning before giving way to Phil Coke and Alfredo Aceves, who combined for a scorelss eighth. Mariano ended it with an easy 1-2-3 inning in with the Mariners couldn't even lift the ball off of the ground. Nady is starting in the AAA rightfield tonight. I imagine he'll be back quite soon if the Yankees don't start hitting. The Yankees had a long overdue team meeting last night. Apparently Mark Teixeira spoke out. If he's already a leader in the clubhouse, as this would indicate, its going to be a good eight years with him in the Bronx. Jose Veras was traded to the Indians. All they got in return was cash. Dissapointing considering what they could have gotten a couple months ago but what are you gonna do? I was reading an article the other day that called C.C. Sabathia the Yankees MVP for the innings he has produced. I thought about that for a while and I had a tough time coming up with someone else who was a better candidate forthe title of Yankees MVP. Its kind of surprising it took so long for me to think of Mark Teixiera. The biggest signing of all of this past offseason moves to New York and ends up almost unnoticed. Since the start of the season we have only used the Mark Teixeira tag four times since spring training began. As a point of comparison, Melky's tag has been used six times since the start of spring training. 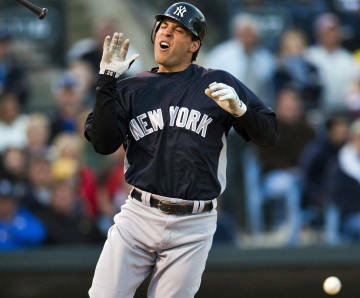 So, I want to take this moment to appreciate the Yankees MVP, Mark Teixeira. He's given us gold glove level defense and silver slugger worthy offense. He doesn't have Alex Rodriguez's flair for the dramatic but last night really was a great example of the type of player he is. He made a great play on defense that could have saved an extra base hit and almost started a rally to win the game in the 9th. A quietly excellent producer who everybody kind of forgot about after his April struggles. Worth every penny, at least so far. For a little while it looked like the Yankees were going to blow this one. Nobody was surprised when they pulled this one out though. Aside from the Yankees many comeback wins this year, Washington's bullpen is absurdly bad. I really feel bad for the National's few fans, if Ron Villone is pitching key innings for you, you're in big trouble. C. C. Sabathia turned in another nice start today. The only mistake he made was the home run he gave up to Anderson Hernandez. However, he went deep into the game again and gave up only three runs. It was a long time before he gave up his one walk of the night. The only concern I have is that he only K'ed two guys. So far C. C. has been good and a big innings eater. However, not the ace we have hoped for. Hopefully, he will repeat his second half surge of last year, to some degree. The return of Brian Bruney to get the last out of the eighth was notable and Mariano turned in a typical 1-2-3 inning for the save. Cano hasn't been hitting lately much at all lately but today may mark the start of a turnaround. If he could get going it would be huge for the Yankees and any time a guy goes 4-4 its a good day. His double at the end of the game essentially put the game away. Texeira also made some nice stretches in the field in contrast to his Washinton counterpart, Nick Johnson, and blasted a HIGH double to left center. All in all, a nondescript win for the Yankees but still a if they lost it would have put them three behind Boston. Nobody wants to blow the series opener against Washington at home either. Going to my first game at the new stadium today felt very much like my first game at the old one. I'm older and I know much more about the game now but it felt very much the same. Part of it was because I went with my mom (seeing as I she lets me live in her basement, it seemed only fair) and some of the rest of my family that went with me to my first game but it was mostly the feeling of awe at my surroundings. For the first time, their was no giant bat or stands selling jerseys. Their were certainly some feelings of nostalgia as we walked past the old, condemned stadium as well. However, it was impossible to feel all that sad when the new stadium came into view. Walking into the "Great Hall" was simply mind-blowing. The massive pictures of great Yankees players and moments are just great tributes to their history and the spaciousness of it all is very welcome. Monument park was unfortunately closed two hours before the game so we couldn't get it, so we went straight to our seats after a quick trip to the (miraculously clean) bathroom. We then proceded to watch eight of the worst innings of baseball I have even seen in person. It started out perfectly fine. Andy Pettitte held the other team scoreless for the first two innings before taking a hit in the third. Raul Ibanez absolutely crushed a ball to dead center to give the Phillies a run and a 1-0 lead. It would last though. Robinson Cano, who had a great game, led off the Yankees half of the third with a leadoff double (or error, depending on what team you root for) and scored with some small ball. Melky bunted him over to third and Nick Swisher got the RBI with a sharp groundout to the shortstop. nd me. One, slightly drunk fan directly in front of me just kept repeating Mayberry's name. From here on out things were pretty dismal. Pettitte battled through seven innings without giving up any more runs and was followed by nearly perfect performances by Phil Coke (1 and 2/3 innings) and Jose Veras (1/3 of an inning). However, the only run they got was a solo shot by Jeter in the 6th. The only other time they came close to scoring was in the 8th when Brett Gardner got a pinch-hit double with one out. Even then, Matsui and Jeter followed up with back to back strike outs to blow the big chance. What was really incredible was how they failed to capitalize on Charlie Manuel removing dominant starter, J. A. Happ after only about 75 pitches. By the time the ninth rolled around the stadium was pretty quiet. The fans woke up in a hurry though. Damon led off with a huge walk and took second while Mark Teixeira struck out. Then came who else but A-Rod. I have to admit that I didn't harbor much hope for him when they got two strikes on him and nodded in agreement when my dear mother felt a need to say, "He's so bad in the clutch." A couple pitches later he ties the game up against Brad Lidge with an opposite field home-run, hit the way only Alex can. The cheers and clapping went on long after Alex crossed home plate. The Yankees didn't waste any time winning it either. Robinson Cano quickly followed him up with a base hit and a rare steal of second which proved to be of the utmost importance. Melky Cabrera then laced a single to right centerfield and Cano ran on home drawing a late throw. It wasn't long before he got the now traditional pie in the face. Not a bad introduction to the new stadium at all. On the way out we ran into a friend who used to sit near our old seats in years past. We also saw that Freddy (of the spoon and pan) had made the trip across the street and that today was his 84th birthday. On the way to the car, I couldn't resist taking a peek through the fence encircling The House That Ruth Built. However, their's no arguing that the new stadium is beautiful and makes powerful tributes to the Yankees proud past. Today gave me confidence that Mystique and Aura have moved across the street and that we to can make a new home for ourselves in this baseball nirvana. According to Fangraphs' UZR, via RLYW, the Yankees project to be seven runs above average defensively this year, a 46 run (or roughly 4 and a half win) upgrade over last year's team. Let's break this down a little. While Fangraphs expects slight regressions from Jeter, A-Rod, and Damon, the major improvements come from the departures of Bobby Abreu (-25.2 UZR last year) and Jason Giambi. While Giambi's -1.8 UZR last year is not horrible, he is replaced with Mark Teixeira's projected +3, which is a half-win upgrade in itself. Abreu's awful mark will be replaced mainly by Xavier Nady, but SG has Nick Swisher seeing some time in right as well. Nady projects to be -1, and Swisher +3. While a +7 team mark is encouraging, I don't think it will be that high. My reasoning for this is that I think SG gave Melky and Brett Gardner too much time in center for his projections. He has Nick Swisher playing just 242 innings in center, and Johnny Damon not playing any. I think that barring any moves, that pair will get at least half the innings in center. However, even with that scenario, the Yankees should still be greatly improved defensively in 2009. This happens to be a fairly close position and everyone is strong here so its a good place to start. Yankees- Mark Teixeira- The Yankees stole him right from under Boston's nose and it probably puts them at the top here. Clearly, he was the best free agent available this year. Teixeira consistently puts up EQA's over .300 ad theirs no reason to think he`ll fall of a cliff at 29. His glove is a big upgrade over Giambi as well. He`s a little overrated in the field but he`s generally solidly above average and good swing a few games that Giambi may have lost. All in all, this position was perenially a concern for a Yankees fans but we shouldn't have to worry about guys like Josh Phelps or Andy Phillips for a long time. Rays- Carlos Pena- Once upon a time, the Yankees picked this guy up after he was released by the Tigers. While the likes of Andy Phillips and Miguel Cairo took turns being automatic outs Pena mashed away at AAA. Finally, he opted out of his contract and signed on with Boston. For some reason, I remember him hitting a walk-off home run for them but I`m a little fuzzy on that. Anyway, after the year he left as a free agent and signed on with the hapless Devil Rays. The past two years he`s been with them and Pena has quietly emerged as one of the better first baseman in baseball. Funny how things work out isn't it? Anyway, Pena has a glove and a bat that is comparable to Teixeira's and can crush the ball. He`s an underrated piece of the Rays. Red Sox- Kevin Youkilis- At some point, somebody (Peter Gammons I`m looking at you) annointed this guy the heir to David Eckstein's throne as the grittiest man alive. As a result of this he went from being one of the most underrated players in baseball to being one of the most overrated. He`s clearly a very good player but not on the same level as Pena or Teixeira. This isn't just my Yankee bias either. In a career year he psoted an EQA of .321 which is great. However, Teixeira has beaten that three of the past four years. Pena crushed that in 2007 (his breakout year) and came close last year. All three of the projection systems available at fangraphs.com have Youkilis coming crashing down to earth next year as well. His glove is probably the best of the three but not significantly so. Its certainly not a weakness for Boston but he`s becoming very overrated. Conclusion- Yankes- Rays- Boston- The Yanks are in the best situation here and Teixeira has a solid edge over Pena but both Tampa and Boston are getting more bang for their buck. As I said before, Youkilis is the worst of this very good group of players. However, its close enough that any of the three could emerge. If Youkilis' 2008 was more than just a career year then he could easily end up better than Pena and could beat out Teixeira for the All Star Game's starting spot as well. As Pete Abe states in this post their is going to be a problem with the Mark Teixiera signing. It probably means they don't have room for Andy Pettitte. This was the very reason why I preferred Adam Dunn. On the other hand, they could just forget about the budget and blow it up for one year and worry about payroll next year when they have even more contracts comign off with a weaker free agent class. Their may be another option though. They could trade either Damon or Nady. Nady probably makes the most sense and might be able to bring back some value to replenish the diminished farm. Its jsut speculation but the Yankees ARE a business and DO have a budget. The Yankees third huge signing of the off-season got done today with their signing of Mark Teixeira. While most Yankees fans are excited about this for at least 2008, does it actually make sense long-term? Personally, I think so. We all know this offense is getting older with them only going to have a few players under 30 in the starting lineup next year. Teixiera has the rare combination of both great hitting and fielding. He`s an athlete and is unlikely to have a fast Giambi-like decline which makes his contract an albatross. Most projections have him being worth about what his average anual salary is. He`s a long-term answer to the offense, not just a one or two year patch like Manny or Dunn. Theirs a few other reasons they did this, as well. First of all, keeping him out of Boston definitely is a plus. The Yankees also see no other long-term options available. They have no real first base propsects in the minors and next year is a weak free agent class. The signings of Burnett and Sabathia also have an impact on this move. To sign Teixeira they essentially only have to give up a third round draft pick because they already signed two type A free agents. In other years they would have to give up a first round pick for a comparable player. I`m a little embarrassed about this and their were better options. However, in a vaccum its a good move. The deal is basically 8 years for 180 million dollars. This keeps him up until his mid 30's. Their is no opt-out as was previously reported. He has a full no trade clause. The average annual salary will be about 22-23 million dollars a year. They`re planning on trading either Damon, Matsui, Nady, or Swisher to make room on the payroll. Their bid was about 5-10 million dollars more than the Red Sox depending on who you`re asking. I preferred Adam Dunn but I can't really complain about this signing. The Yankees spending IS ridiculous and something really has to be done about it. The Yankees still plan to make at least one more major move this off-season according to Joel Sherman. In order to afford both Teixeira and Andy Pettitte, they`re going to try and trade one of Swisher, Nady, Damon, or Matsui. This obviously takes away some of the upside from the Teixeira signing but he`ll still help the team a ton. According to a few different reports, the Yankees have signed Mark Teixeria to an eight year deal worth about 180 million dollars. I`m slightly dissapointed but at least it wasn't Manny and my preference of Dunn over Teixeria was small. More on this later. According to Buster Olney, the word is that the Nationals do not expect to win the bidding for Mark Texiera. This seems to suggest that they did not make a sudden ridiculous offer, topping the Red Sox. This makes me think he`ll end up in Boston unless the Yankees can shed some payroll in the form of Matsui or Igawa. Today we had two reports essentially saying that the Yanks are interested in Texiera but are reluctant to go past 8 years, 160 million. Boras has told them that they need 8 years 180 million dollars to entice Texiera. As Mike Schmidt notes, they`re going to have to get creative with the payroll if they`re going to sign Texiera. However, next year they, again, have a lot of payroll coming off so they might be able to pull it off. "We met with Mr. Teixeira and were very much impressed with him. After hearing about his other offers, however, it seems clear that we are not going to be a factor." After that we got a response from Scott Boras who probably does not like this. "The Boston ownership was kind enough to request and travel to meet with Mark Teixeira. While it was a very positive meeting Mark was candid and advised he is in the process of making a decision and is now attempting to eliminate teams." First of all, this does not mean Boston is out of the bidding. It just means that they are holding with their offer of 175-180 million dollars over 8 years (about 23 million a year). It just means that Boras told them that another team had made a bigger offer and they`re refusing to go any higher. The Orioles have seemingly faded from the chase and now we know that the Yanks were not the ones to sweep in with a huge offer. This leaves the Angels and Nationals. It doesn't seem like the Angels would do something rash like that and give him a ridiculous contract, no matter how good of a fit he is for them. On the other hand Jim Bowden, the Nationals GM, is definitely capable of something like this. It makes no sense but if somebody did in fact outbid Boston and it wasn't the Yankees, then the Nationals are the most likley destination for him. I would love to see him head to the NL East where he can't hurt the Yanks and take away a competitor for Adam Dunn. What's more likely though, is that Henry and Boras are both bluffing. In truth, nobody has probably topped Boston's offer and he will end up in Boston in the end. Even after doling out huge contracts to Burnett and Sabathia, Cashman still has about 20 million dollars to spend. Their only real hole is in centerfield. However, both Damon and Swisher can handle centerfield, albeit poorly. Lets assume they`re not going to trade for a centerfielder like DeJesus which may ultimately be the best course of action. We`ve already established Manny just doesn't fit on this team. He`d have a hard time squeezing onto the payroll and probably isn't worth the contract he`ll get anyway. That leaves two big hitters left on the market. Adam Dunn and Mark Texiera. Mark Texiera is a fantastic hitter and a gold glove level fielder at first base. That combinations is pretty rare. He`s not quite on the level of the Albert Pujols and A-Rods of the world but he`s definitely on that next tier of players. He`s only 29 and has gotten big offers from the Angels, Orioles, Nationals, and Red Sox with the Yankees showing interest. On the other hand, we have Adam Dunn. All three of us have been in favor of signing this guy for a long time. It still makes a ton of sense. This guy is also a great hitter, not on the same level as Texiera but he`s still a great hitter. The biggest problem with him is his glove. At first base he is on the same level as Giambi. That would allow Swisher to move into left-field though where he is very good. That makes them a wash but Damon in centerfield is a problem and will cost them a couple wins. Texiera is pretty obviously the better player at face value. However, Texiera is rumored to already have an offer of 160 million dollars over 8 years (20 million per year) from the Nationals with the Red Sox, Angels, and Orioles not far behind. Normally, he`d be worth that type of contract, especially to the Yankees who are going to be on the brink of the playoffs next year. Their's also the added benefit of keeping him away from AL East teams (Boston and Baltimore) and rivals (The Angels and Boston). However, that keeps them from pursuing help in any other area. It means they will go into the year with a bench of Ransom-Gardner-Molina-Cabrera and they will be forced to again put Hughes in the Opening Day rotation. Dunn makes much more sense to me. The only team that has really expressed interest in him are the Nationals, who are currently the highest bidders for Texiera and have Nick Johnson already at first. He's the backup plan of a few teams but not many. Dunn may have to settle for 3 years at 36 million dollars or maybe even less. He`s only 29 (same age as Texiera) and a 3 year deal would probably get him in the best years of his career at about 12 million dollars a year. For a guy with Dunn's bat, that's a bargain. It also lets them make a few other moves. First of all, they can hold their offer to Andy Pettitte. They also have enough cash to pursue some other interesting names like Rocco Baldelli, Ty Wigginton, Juan Rivera, and Joe Nelson for the bench/bullpen. Rocco Baldelli in particular interests me now that we know more about his condition. Its a choice between Texiera as the first baseman, Hughes as the 5th starter, Kennedy/Aceves as injury fill-ins, and Brett Gardner/Melky Cabrera as your backup outfielders or Dunn as the first baseman, Pettitte as the 5th starter, Hughes as injury fill-ins and Rocco Baldelli/Brett Gardner as your backup outfielders. Signing Dunn allows them to make a deeper and better team.